Daniel Laury, CEO of Udelv Inc., a San Francisco-based firm that has been delivering retail goods and groceries in cars and vans with self-driving capabilities for the past year, described the future for transportation in epic terms. According to Laury, a study commissioned by computer chip maker Intel predicts autonomous driving will spur development of a new “passenger economy” worth $7 trillion by 2050 with business use of mobility-as-a-service expected to generate $3 trillion in revenue. More than 6 million vehicles are in use for last-mile delivery and with e-commerce sales projected to quadruple over the next decade, many business and government officials say they expect to see rapid adoption of autonomous vehicles by delivery firms. “Autonomous vehicles will slash delivery costs to pennies per order,” Laury said. In December, Udelv received funding from Japanese firm Marubeni Corp. to expand its business beyond the San Francisco Bay area. On Jan. 9 at the CES show in Las Vegas, the company announced plans to begin making deliveries for Walmart in Sunrise, Ariz., and for XL Parts in Houston using a newly designed van built on a Ford Transit chassis that features a sliding adaptive cargo-holding system. Matt Thompson, vice president of digital at The Kroger Co., the nation’s second-largest supermarket operator, said autonomous vehicles are a key part of the company’s strategy to expand its business from 90% of U.S. households in 35 states to 100% of households in all states by providing inexpensive delivery of fresh produce, groceries and meal kits. “We want to offer customers what they want anytime, anywhere,” Thompson said. Online sales already generate about $5 billion in annual sales for Kroger, and that is expected to double by the end of 2019, Thompson told the conference attendees. In December, Kroger made its first unmanned delivery of groceries from a Fry’s Food Stores location in Scottsdale, Ariz., using a battery-powered delivery vehicle produced by Nuro, another Silicon Valley startup. 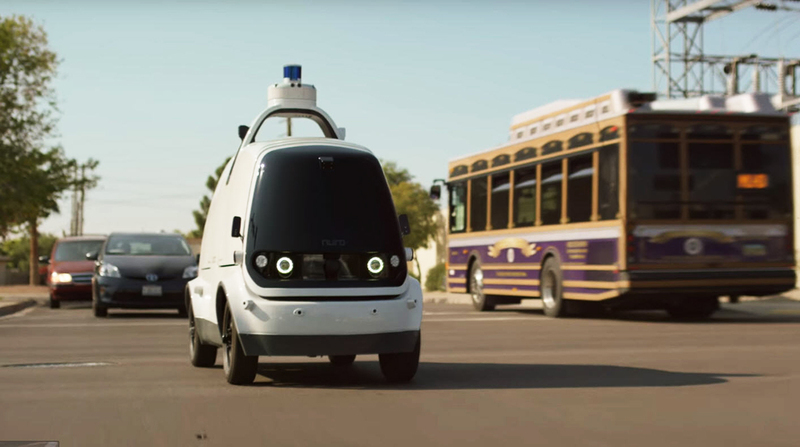 Cosimo Leipold, a business strategy specialist for Nuro, asserted that the use of low-speed unmanned delivery vehicles is safer than humans driving cars and that the lower cost gives small local businesses a way to compete with Amazon.com and other e-commerce retailers. For public authorities, there are other benefits as well. Sensors attached to robotic vehicles can check for potholes and perform other routine tasks, such as testing the reflectivity of road signs, a job now performed by personnel traveling in cars. For transportation planners, the question of whether the adoption of autonomous vehicles will increase or decrease traffic is important because it will inform decisions about where to build roads and how to adapt existing roadways to accommodate more freight deliveries. In a study for the state of California, officials at Nuro estimated that within five years, autonomous delivery could replace 3 billion miles of driving by passenger cars, plus boost retail sales by $10 billion and create 130,000 jobs. Kroger’s Thompson said consumer acceptance of autonomous delivery has been “incredibly enthusiastic,” and he believes that the company will soon add “thousands and thousands” of autonomous delivery vehicles to its fleet, which is one of the largest in North America. Kroger ranks No. 40 on the Transport Topics Top 100 list of largest private carriers with 879 tractors, 35 straight trucks and 11,211 trailers.